Cut back on meat and animal products and boost plant-based foods in your diet to reduce risk for cancer. Portobello mushrooms make a great substitute for meat since they have a very “meaty” texture and take on the flavors of the seasonings used to marinate them. These portobello mushroom fajitas are perfect meal for a Meatless Monday— or for any time you are looking to add more plants to your diet! For more, check out our Ten Tips for Healthy Living post to learn more on how to reduce risk of cancer! Wash all the veggies. Chop the mushrooms into smaller pieces. Slice the peppers and onions into thin strips. In a pan, sauté the mushrooms without oil. In a bowl, combine the spices with the juice from one lime. Add the spice mixture to the mushrooms once the mushrooms are tender. Add a few tablespoons of water to the pan if necessary. Continue cooking until desired texture. Set aside. Sauté the onions and the peppers until desired texture. 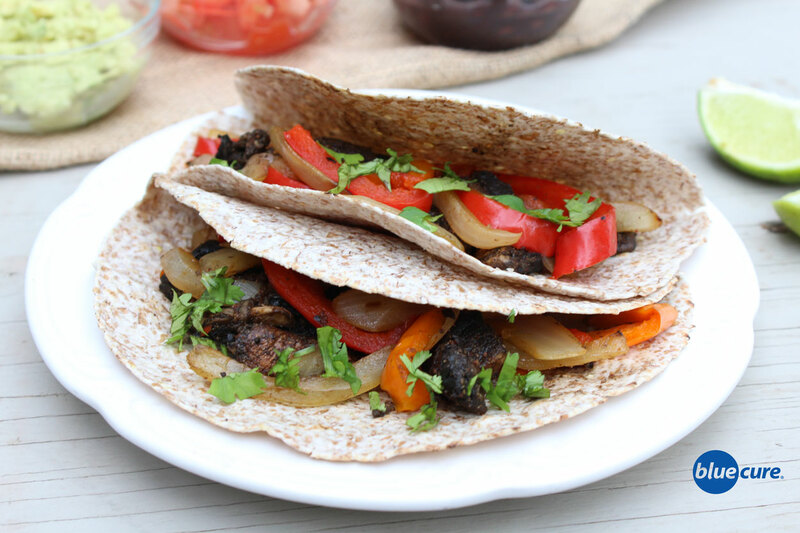 Layer the peppers, onions, and mushrooms on warm tortilla shells. Top with avocado slices (or mashed avocado) and cilantro. Option to also add black beans, tomatoes, and salsa.